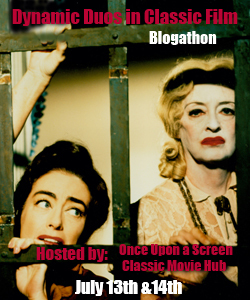 This is part of the Dynamic Duo blogathon, which is being held by Once Upon a Screen and The Classic Movie Hub. Pay em a visit. Lots of good film writing to be had. When I finally settled on doing a piece about the long collaboration between Akira Kurosawa and Toshirô Mifune, I wasn't really thinking about the sheer hubris of such a thing. I mean, I've read Stuart Galbraith's book on the two, The Emperor and the Wolf, and at 850 pages, that sucker is a brick. And I want to distill Kurosawa and Mifune into the three to four thousand words of a blog post? Madness. This is complicated, too, by the fact that neither man was the other's favorite interpreter. Kurosawa made 16 films with Mifune (25 if you count films that Kurosawa wrote but did not direct). Compare that to the two dozen films Mifune made with Hiroshi Inagaki or the two dozen films that Kurosawa made with Takashi Shimura and you have a seriously compromised premise. Indeed, Shimura is arguably the director's on-screen avatar of himself in Ikiru and Seven Samurai and Drunken Angel, so I probably ought to think hard about the underlying premise that holds the Kurosawa/Mifune collaboration as being definitive for both men, because it's possible that it's wrong. 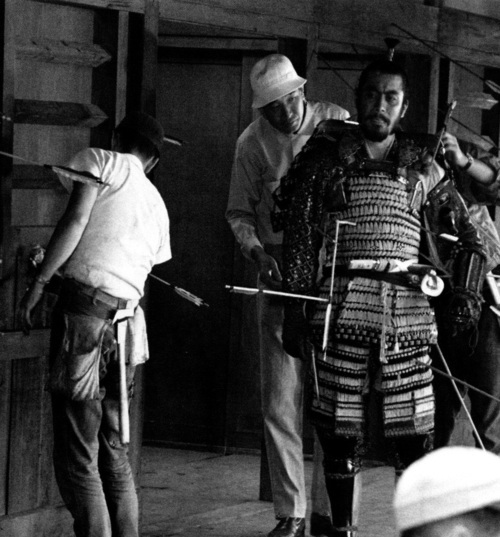 Be that as it may, when you think of Kurosawa, you will inevitably also think of Toshirô Mifune eventually. That's a meme in action for you. And, really, their collaboration is like chocolate and peanut butter. Regardless of whether it's definitive or not, it most surely is tasty. Akira Kurosawa and Toshirô Mifune first crossed paths in 1947. Kurosawa "discovered" him as part of Toho's "New Faces" initiative, where Mifune's intensity frightened executives, but excited directors. It was their influence--particularly Kurosawa's--that convinced Toho to hire Mifune from among a multitude of applicants. Mifune, for his part, didn't take acting seriously. He had applied to the program as a means of getting on the lot in order to pursue a career as a cinematographer. He had been a cameraman during the war. The intensity of his audition slotted him as a type: Mifune's early roles saw him playing gangsters and thugs, but even in these roles, thankless though they are, Mifune's range became apparent. In his first film, Mifune plays one of a trio of bank robbers on the run in Ginrei No Hate (Snow Trail), directed by Senkichi Taniguchi from a screenplay by Kurosawa. Kurosawa had already established himself as a director during the war and immediately afterward and although Kurosawa is listed as a screenwriter, his fingerprints are all over this film. He wrote it for his friend, Taniguchi, who was directing his own first film. Kurosawa had a significant hand it its casting. The film stars Takashi Shimura, who already had a working relationship with Kurosawa having appeared in five of the director's films, including his first. The second bank robber was played by Yoshio Kosugi. Mifune plays the third. He was the last character to be cast. Taniguchi recruited him for the film after meeting the actor on a train and discovering that not only was he perfect for the role, he was working for Toho. Regardless of its director this is a prototype for the kinds of films that Kurosawa would make in the coming decade, in which identity is shifty and no one is the person you thought they were at the beginning of the film. Kurosawa would first direct Mifune in Drunken Angel, a year later. Perhaps one of the reasons the Kurosawa/Mifune collaboration resonates in the imagination more than Kurosawa's relationship with Takashi Shimura or, later, with Tatsuya Nakadai, is because Mifune appears in Kurosawa's films at the exact moment that the director begins to make his major works. Drunken Angel is arguably the first film that is recognizable as a "Kurosawa" film, where the director's visual sensibility is fully in place and where the major thematic elements of his great films of the next decade begin to coalesce. It's almost as if Mifune provides a catalyst that Shimura does not, though, to be fair, Drunken Angel is as much Shimura's film as it is Mifune's. 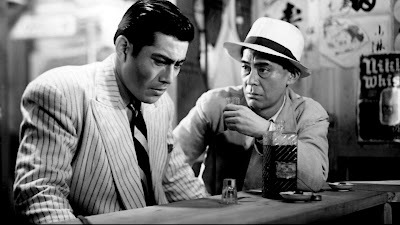 Shimura's drunken doctor is the central viewpoint of the film; Mifune's tubercular gangster is the main object of his gaze. And why not? Mifune is immediately a movie star as soon as he appears in this film: darkly handsome with soulful eyes and a tragic character arc. When Mifune was on the screen all eyes turned to him. Even late in his career, when in character parts he became a kind of samurai elder statesman, he compelled the audience's attention. Such is movie star charisma. For his own part, Kurosawa begins to formulate the elements of his own cinematic anima. The plot, in which Shimura's doctor tries to save Mifune's gangster as much from himself as from tuberculosis has elements that later find their way into Ikiru (a man trying to make meaning for himself before time runs out), Seven Samurai (a wise older man attempts to save a younger man from himself), and Rashomon (in which a bandit has hidden depths). 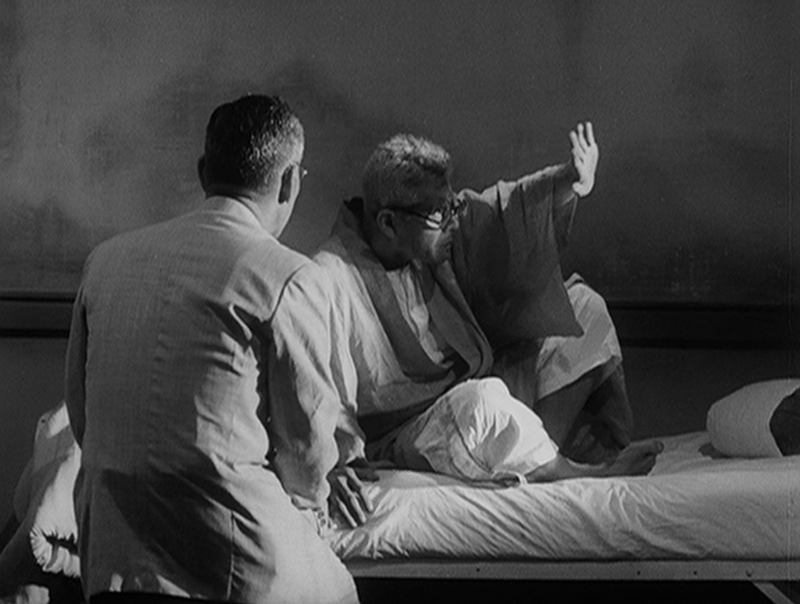 It's also the first of three movies that Kurosawa made about doctors. The second of those films, The Quiet Duel, recasts Mifune himself as the doctor and doubles up on his character by making him the victim of an incurable disease (in this case, syphilis). In the third doctor film, Red Beard, Mifune assumes the role of the older doctor. It's in the switch between gangster and doctor in Drunken Angel and The Quiet Duel and between youth and experience between those two and Red Beard that we begin to see why Mifune became so integral to Kurosawa's films. Kurosawa's major themes are epistemological: What is truth? What is identity? What is real? What has meaning? You see this most famously in Rashomon, with its competing versions of reality, and in Kagemusha, with its doppelganger, but you see it in more subtle ways in his other films, too. In Seven Samurai, deception is a recurring motif among both the samurai and the peasants. In High and Low, the film's famous ending blurs the line between rich man and poor, hero and villain, as they reflect each other. 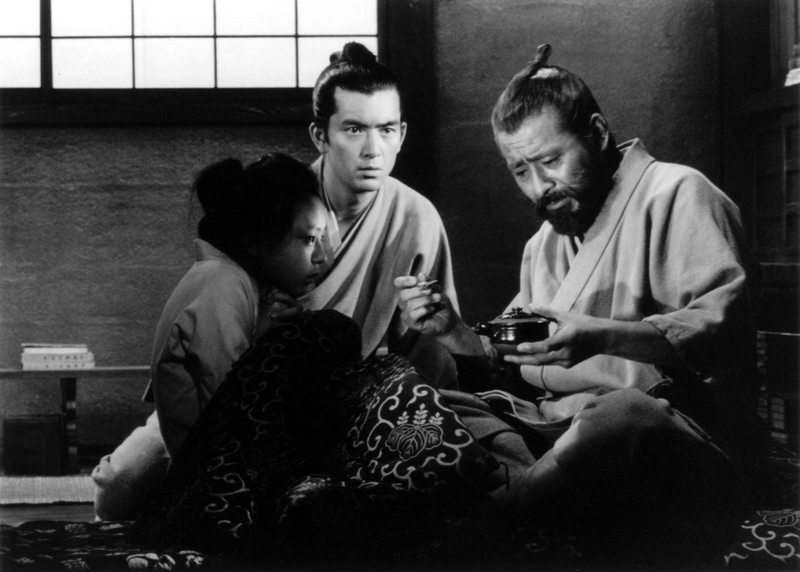 In Yojimbo, the eponymous anti-hero spins a complicated web of lies. An early manifestations of this can be seen at the end of Drunken Angel, when two men become so covered in paint in the course of fighting each other that their identities are obscured. This idea is taken a step further in Stray Dog, in which the cop protagonist and crook antagonist become so covered in dirt in the fight at the end of the movie that distinctions between them become meaningless. Toshirô Mifune is often wrongly spoken of as an actor who mostly played himself, a la John Wayne or Cary Grant. If this were true, he would have been useless to Kurosawa. Kurosawa required and got a chameleon, an actor who could play an ambitous young man in Scandal and a mad old man in I Live In Fear within the span of half a decade. It didn't hurt that Mifune had the screen presence of a movie star. That was gravy. The film that best demonstrates what Kurosawa needed and got from Mifune is Rashomon. Later in life, Mifune was said to cringe at his performance in Rashomon. He thought it too broad and too buffoonish, but that's only part of the character. The last sequence, in which the ghost retells the events of the story, requires Mifune play the role as restrained, and he delivers. He delivers in every avatar of the character the film presents, from rapacious bandit to braggart to reluctant witness. His performance is really several performances, each distinct from each other. This carries over to Mifune's career with Kurosawa as a whole. He's a young braggart in Seven Samurai, a wise soldier in The Hidden Fortress, a gangster in Drunken Angel, a cop in Stray Dog, a tycoon in The Bad Sleep Well and High and Low, a vagabond in Yojimbo and Sanjuro, a thief in The Lower Depths. Kurosawa wasn't above using Mifune in his capacity as a movie star. A careful student of John Ford, Kurosawa understood the power of mythmaking and indulged in it himself. In Mifune, he had his John Wayne and he built Mifune's movie star myth around him. My own personal favorite instance of this is at the beginning of The Bad Sleep Well. We're first introduced to Mifune's character as an anonymous groom at a corporate wedding, but when we're introduced to his character, if you catch my drift, Kurosawa pulls out the stops and has Mifune descend into the film from the summit of an active volcano. There are basically three groupings of films in which Kurosawa and Mifune collaborated. The first grouping consists of Drunken Angel, The Quiet Duel, Stray Dog, Scandal, The Idiot, and I Live In Fear. There's a broad thematic range among these movies and hugely varied performances by Mifune. These movies tend to be more experimental than the director's more famous films. One is an adaptation of Dostoyevsky. 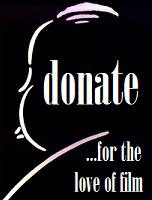 One is in the style of American film noir. One dwells in the shadow of the atomic bomb. What these films have in common is a director who is still feeling out his themes. Stray Dog is the the best of these films, but each of them has its pleasures. Scandal is perhaps the slightest of them, but it's a film that's completely smitten with the idea of Toshiro Mifune as a leading man. The Idiot is one of the great murdered movies, having been cut down by over an hour to its present running time. I Live In Fear is one of the director's most underrated films, one soaked in nightmares of atomic destruction. Of the films Mifune starred in for Kurosawa, it's the only one where the actor is a poor fit. He's simply miscast. The second grouping consists of the samurai movies: Rashomon, Seven Samurai, Throne of Blood, The Hidden Fortress, Yojimbo, and Sanjuro. These are the films that come to mind when the name of either Kurosawa or Mifune is mentioned. For Kurosawa’s part, the samurai films are as restlessly experimental as the rest of his cinema. Rashomon’s recursive flashbacks circling around one central event is only the most gaudy of these. Seven Samurai incorporates more subtle experiments in time and perception. The way it films the end of the film’s first duel in slow motion, for instance, was not a common effect in action filmmaking at the time. It’s such a ubiquitous technique these days that it’s hard to remember how novel it was in 1954. The way the film uses the elements--particularly its climactic rainstorm--is endlessly creative, too, adding a level of complexity to the images on screen that's absent in other contemporary actions films. That use of the elements becomes deeper in Throne of Blood, where it’s used to bring "Birnham Wood come to Dunsinane" to terrifying life without seeming contrived, fanciful, or corny even though it’s a scene of deep mythological resonance. Throne of Blood sees the director drawing more heavily from a theatrical tradition, too, with its kabuki theater witch. By contrast, The Hidden Fortress was conceived as pure entertainment. Visually, it's the most conventional of Kurosawa's samurai films, but for the fact that its Kurosawa's first film in widescreen. Thematically, it's a departure. 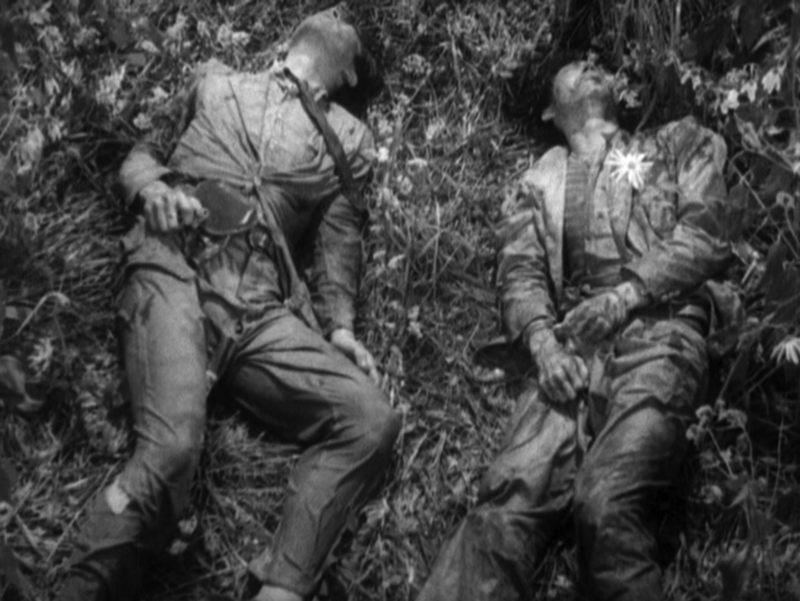 Kurosawa isn't known as a director of comedies, after all, but The Hidden Fortress is light and frothy in comparison to the other films the director was making at the time. Apparently, he had a taste for it, because Yojimbo is as cynical a comedy as you're likely to find. These films chart a kind of evolution for Mifune as an actor and as a movie star. In the first two samurai films, he's a bandit, a hyperactive buffoon. In Throne of Blood, he's an ambitious warlord, ruthless and without honor. In The Hidden Fortress, he's a wise and world-weary soldier. And in the Yojimbo diptych, he's cynical and philosophical. The end of Sanjuro has the final word on Mifune as a samurai: he's a sword that's best left in his scabbard. As a matter of performance, Mifune goes from the hyperactive histrionics of his character in Rashomon to the quiet, laconic menace of Yojimbo. as if the act of appearing in these movies taught the actor how to eliminate anything but the barest essentials from his performances. As an aside, the character arc of Mifune's screen image in these movies is replicated in Hiroshi Inagaki's contemporaneous Samurai Trilogy, in which Miyamoto Musashi goes from callow youth to wise samurai in the course of three movies. It's not an accident that outside of Kurosawa's films, Miyamoto is arguably Mifune 's best-known part (he played him four times). 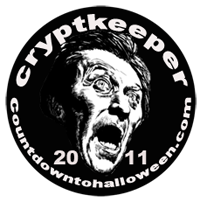 The third grouping consists of more assured dramas: The Lower Depths, High and Low, The Bad Sleep Well, and Red Beard. In some ways, these four films are a reworking of the duo's early films. Red Beard is their third "doctor" movie. High and Low echoes American film noir a la Stray Dog. The Lower Depths is another adaptation of a Russian source text (this time, it's Maxim Gorky). The Bad Sleep Well is another look at the machineries of then-contemporary Japan as filtered through Shakespeare. These films are deeper and more resonant while maintaining the younger Kurosawa's restless experimentation with form. My favorite of these experiments is the way High and Low is structured: The first half of the movie is tightly contained within the house of Mifune's embattled shoe tycoon. It's a microcosm where the thorny moral dilemma of how to respond to the mistaken kidnapping of his chauffeur's son can be contained and concentrated. When the film then opens up into Tokyo itself, it's a jarring tonal shock. The inclusion of a single shot in color--in which red smoke rises from a smokestack--is another striking formal experiment, though a subtle one. By contrast, The Lower Depths keeps all of its action in a single location, echoing its roots on the stage, while visually placing everything at the very bottom of the world. It never opens up. Red Beard brings the collaboration between Kurosawa and Mifune full circle. It replicates the character dynamic of Drunken Angel with Mifune assuming the role of the wise older doctor trying to provide direction to a callow younger man. This isn't really Mifune's movie, per se, given that the title character isn't the center of the story, but Kurosawa uses Mifune in the part in a way that he never used Takashi Shimura. His screen image intimidates Yûzô Kayama's Dr. Yasumoto in a way that Shimura never could. At this point, Mifune had moved beyond being just a Japanese leading man and had become THE Japanese leading man. At the parting of the ways, the actor was headed in a very different direction than his director. He had founded Mifune Productions to incubate staring roles for himself. He was busier in the 1960s than he had ever been. Kurosawa, on the other hand, entered a long eclipse. As I mentioned at the outset, Toshirô Mifune made more films with other directors than he did with Kurosawa, but in spite of this, he never really escaped Kurosawa's shadow. The actor's films with Hiroshi Inagaki, particularly The Samurai Trilogy, but also Samurai Banners and Chushingura, find the actor working well within the character range established by Kurosawa, though in films that are more traditional and less experimental. The first time I saw the opening shots of cherry blossoms in Chushingura, for example, I couldn't help but think of Nagisa Oshima's condemnation of traditional Japanese films as being "foggy history and flower arrangements." Mifune's long collaboration with Kihachi Okamoto, on the other hand, is very interesting. If Kurosawa is the samurai film's John Ford, then Okamoto is its Robert Aldrich. His films are deconstructions of the samurai film, and Mifune's work in them is the equivalent of John Wayne appearing in, say, Ulzana's Raid, something Wayne would have found politically repugnant. Mifune, on the other hand, was more daring than that. The key film in Okamoto's out put is Kill! (which does not star Mifune), in which its yakuza anti-hero tells a would-be samurai "Now you see what samurai are like" every time they do something horrible--and they do something horrible almost all the time. Kill! is typical Okamoto: it has a serious purpose hiding beneath a veneer of black humor. The director's best known collaborations with Mifune are atypical: The Sword of Doom, Samurai Assassin, and Japan's Longest Day are bleak in the extreme. Both Mifune Productions and Toho viewed Okamoto as a kind of prince in waiting to take the place of Kurosawa. There are certainly some stylistic similarities and it was Okamoto who was tapped to direct the inevitable team-up of Yojimbo and Zatoichi, but Okamoto was a poor fit for this role. 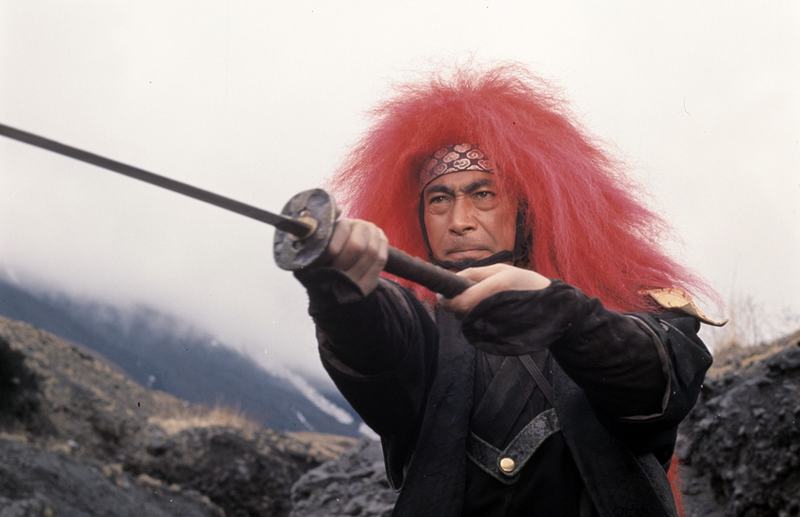 Of his films with Mifune Red Lion is the one I like the best and it's the least like Kurosawa of any of them. Visually, it shades into the Japanese New Wave and it shares thematic similarities with Shohei Imamura's Eijanaika. This is more Okamoto's speed: a bitter satire of the samurai film featuring it's iconic actor. By my lights, Mifune's best film for another director is Masaki Kobayashi's Samurai Rebellion, the only film he made for Kobayashi. 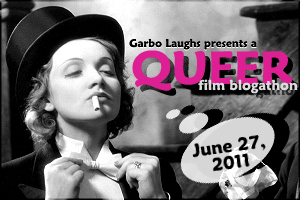 This is a film that could be mistaken for a Kurosawa film, too. It certainly uses the familiar role of Mifune as a samurai patriarch. That being said, Rebellion is all of a piece with Kobayashi's worldview and its ending has a kind of nihilistic downdraft that the Kurosawa of the 1950s never would have explored. Made two years after Red Beard, it's the last time that Mifune would star in a legitimately great movie. The rest? Character roles and guest appearances. He wasn't done as a star attraction--certainly, he's the reason to sit through Shogun--but his glory days were over. Kurosawa's subsequent career was very different. Following the expensive box office failure of Red Beard, it would be another six years before he would direct another film. The rambling Dodes'ka-den was radically unlike the films Kurosawa made with Mifune. 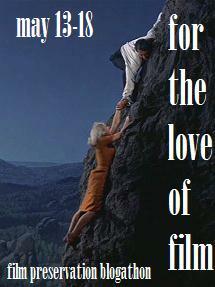 A downbeat fantasia of a film, it's characterized by a striking artifice. It's Kurosawa's first film in color and he uses color to create a kind of otherwhere. 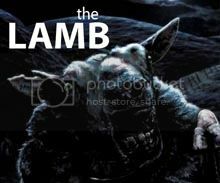 Its lack of any cohesive plot contributed to its ultimate failure. After Dodes'ka-den came a suicide attempt and then exile. His only other film of the 1970s was Derzu Usala, for which he had to go to the Soviet Union for funding. 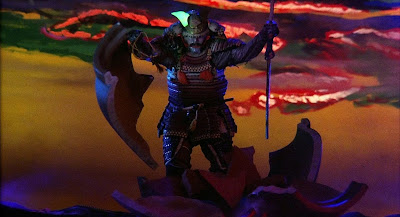 On the surface, both Kagemusha and Ran seem like the kinds of films that Kurosawa made with Mifune. Both of them are samurai films. Ran, like Throne of Blood and The Bad Sleep Well, is based on Shakespeare. But on closer examination, they're both profoundly different. Both of them find the director raging at the universe in a way his earlier films do not. They're also more highly decorated, if you know what I mean. Kurosawa spent literally years making paintings of these movies before he could get them financed, and as a result, they seem perhaps a bit over-ornate and even a bit theatrical. There's a meme in studies of Japanese films that suggests that Kurosawa's late career is like watching the history of Japanese film running in reverse, as it devolves from the contemporary dramas of the early 1960s into Noh theater pantomimes. This is especially true in Dreams, which replicates the color experiments and fantasia of Dodes'ka-den. So does Rhapsody in August, on a smaller scale. 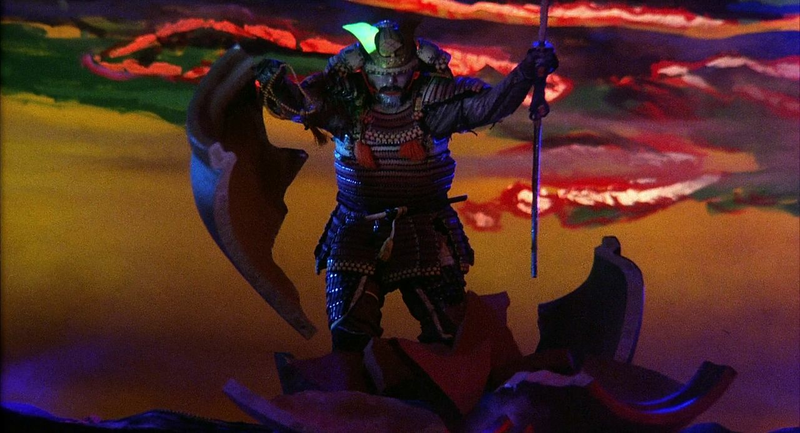 Still, both Kagemusha and especially Ran are thought of as late-career masterpieces, and I won't quibble with that. Ran in particular carries a nasty jolt and closes with one of the bitterest images in all of Kurosawa's films, as a blind man teeters on a precipice. It's a legitimately great film, but I can't help but wonder. Much as I like Tatsuya Nakadai, I think both films would be better with Mifune in the lead. At this point, I can't help but think about that image at the end of Stray Dog, in which the cop and the crook wrestle in the dirt until they're indistinguishable from one another. Or that image at the end of High and Low, as Mifune sees his own face reflected in the glass outside where the kidnapper is held. Gaze at Kurosawa and you'll see Toshirô Mifune. At some point, they become inseparable. Hi there! 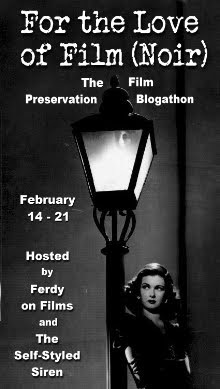 I think you probably picked the most dynamic of duos for this blogathon. Thanks for your thoughtful and intelligent post. I have not yet seen Red Lion but it sounds like I will have to very soon. Great post! Hi, Fritzi. I hope you enjoy Red Lion. Thanks for the kind words.